The new self-cleaning filter bags for the CT MIDI dust extractor solves a problem that plagues other dust extractors and vacuums. During normal use, fine particles of dust cling to the inner lining of the filter bag resulting in caking. This coating of dust lowers the effective suction power dramatically resulting in poor extraction efficiency and performance. Caking can also cause additional strain on your dust extractor's motor and contribute to premature failure. 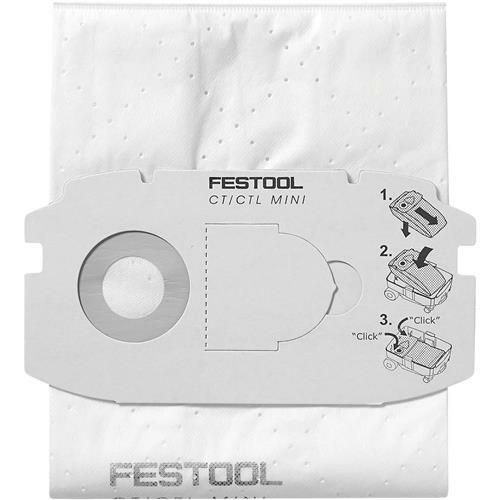 Festool has addressed this issue by developing a unique pliable fleece filter bag. Because the bag is not rigid like many other types of bags, such as paper bags, it prevents caking. This means that your Festool CT MIDI dust extractor continues to deliver full suction until the bag is virtually completely full. Other manufacturers feet bags do not counter this caking effect and suction is reduced dramatically throughout the use of the bag, often resulting in a situation where suction is lost before the bag is completely full. When this occurs, you're paying full price for a partially used bag. The Festool filter bag also serves as a pre-filter and is able to trap dust particles down to five millionths of a meter, or 5 microns. This is about the same size as a red blood cell. By arresting these small particles, in addition to larger chips, the bag extends the life of your main HEPA filter, reducing wear and tear as well as the expense of frequent filter replacement. Bag disposal is quick and mess-free. An integrated closure on the bag shuts the opening to prevent spilling. The material is made to be tear resistant and prevent bag blow outs which can be messy to clean up.